Sara and Rob - the monster from the compost. Sara is about the most curious girl in the world. Of particular importance to her are questions about nature and the protection of the environment. Together with her friend Rob, a true and waterproof robot, the girl with the two braids experiences surprises again and again. This time her nose is especially in demand. Rob is a robot. It was built by Sara's uncle, who will play an important role in this book. The uncle works in a workshop and is something of a scientist. Rob is his masterpiece because he can talk, calculate and even fly. So he can answer most of Sara's many questions and take them to where new adventures await. 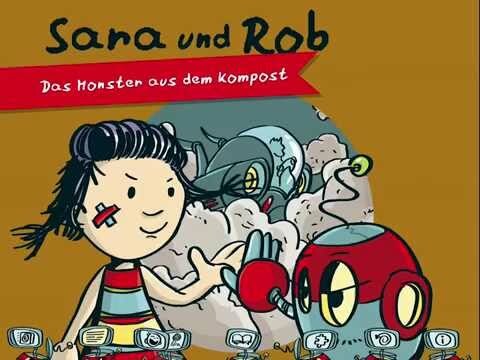 You will not only be able to browse through the second adventure of Sara & Rob's "The Compost Monster" as an interactive book, but also discover a lot for yourself. Some of the objects you see on each page can be brought to life by tapping them. Take a close look at all the pages. On some pages, you can collect organic waste by tapping it with your finger. The collected organic waste you can look at in the scrapbook closer, and decide whether you can produce biogas or compost with it. If you like, you can not only read the book, but also solve various puzzles and play a game of skill with organic waste. Experience the adventures of Sara & Rob in a brand new version with some improvements.